A lot of books and articles you read talk about giving up salt and sugar in order to maintain good health and ultimately save money in the form of reduced medical expenses. The whole problem with the approach that is taken most often is that people end up with boring, bland food that a normal person wouldn’t feed to anyone. If you really want to make positive changes in your diet, then you need to do something positive. The excessive salt and sugar in many people’s diets today are viewed as a negative by the medical community—simply telling someone to reduce their intake won’t have an effect because it’s a negative request. What the emphasis should be on is to replace sugar and salt with something positive. Making meals an explosion of the senses so that the salt and sugar aren’t even missed is key. Herbs and spices are your first line of defense against excessive salt and sugar use. For example, adding four parts cinnamon, two parts nutmeg, and one part cloves at a level you can just barely taste to meats will allow you to reduce your salt usage on that food by at least half, if not more. Give it a try and you’ll find that you enjoy your meat a great deal more. Another good combination is a mix of 3 parts garlic, two parts rosemary, two parts ground ginger, and one part orange peel. This mix works especially well on white meats. Don’t overdo it—a little goes a long way. Try increasing the amount of the mixture until you can just taste it and then cut the salt dramatically (by half is a good starting point). When working with herbs and spices, the idea is to provide your nose and mouth with something interesting that will maintain your attention throughout the meal. Some herb and spice combinations require a heavier touch. For example, when using a mix of rosemary, sage, and thyme on chicken, you want to add enough to really season the meat. A mix of paprika and garlic on pork should be somewhat heavy. Everyone has different tastes (and it would be a really dull world if we didn’t). Experiment with various combinations to see what meets your needs best. The point is to provide your mouth and nose with something interesting and stimulating. While you tantalize your taste-buds and waft through a sea of smells, you should also give your eyes something that appeals to them. Color is essential in meals. Meat and potato combinations are blah—you have to salt them just to get rid of the sad look of such a meal. A better choice is to have a small amount of meat and possibly potato (try substituting brown or wild rice for potatoes whenever possible), but to also have some reds, greens, oranges, blues, and purples in there. For example, purple cabbage is a great addition to a meal because it has a wonderful color that doesn’t cook out and an amazing taste. There are also useful staples to a meal such as corn, carrots, green beans, and peas. Try supplementing these staples with kohlrabi, broccoli, Brussels sprouts, spinach, and Swiss chard (to mention just a few). The Swiss chard actually comes in a number of beautiful colors. Make your meals a feast for the eyes as well as the stomach and you’ll find that you need both less sugar and less salt to satisfy. Most people have probably read about the use of herbs, spices, and color to make meals more interesting, but the one factor that is left out most often is texture. The simple addition of mushrooms or nuts to a meal can make the entire experience of chewing so much better. These items also add flavors and smells all their own. However, the use of texture also affects the eyes and even the sense of touch. Your hands will become involved in the eating process because forking up green beans alone is much different than forking up green beans garnished with sliced almonds or mixed with mushrooms. In some cases, even hearing becomes involved, especially when you add crunch to the collection of textures. Corn mixed with colorful sweet peppers is so much better than corn alone. Rice with walnuts and raisins tastes a whole lot better than just plain rice. The bottom line is that you really shouldn’t be giving anything up—you should be replacing just two negatives (salt and sugar) in your diet with a whole host of positives. Over the past six weeks we’ve managed to get by without adding any sugar or salt to our diet. At this point, we don’t even notice that they’re missing. In fact, some foods simply seem too salty or sweet to enjoy at this point. Give it a try and let me know your thoughts about replacing the negative items in your diet at John@JohnMuellerBooks.com. It’s a perfectly wonderful way to enjoy a birthday together, but I wanted to try something else this year. Unfortunately, as I previously stated, my cooking skills are of a highly practical nature and tend toward meat and vegetable dishes (such as the Brussels sprouts recipes in my Making Brussels Sprouts Palatable), so I decided to try a mix for my first baking attempt. 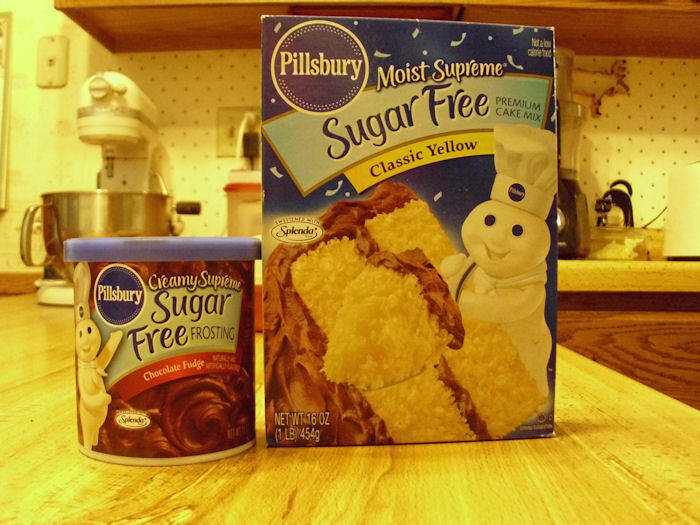 I found a perfectly wonderful Pillsbury Sugar Free Classic Yellow mix and the accompanying Sugar Free Chocolate Fudge frosting at my local store. In looking at the ingredient list, I did find that there is a certain amount of sugar alcohol in both products, in addition to the Splenda. When I compared the other ingredients, I didn’t see any significant differences. So, what you’re getting is a cake mix and prepared icing that has a number of artificial sweeteners in it. The calorie content of both products is lower per serving, but this is most definitely not a low calorie food. There isn’t any free lunch when it comes to excess calories. I decided to make cupcakes instead of a cake. 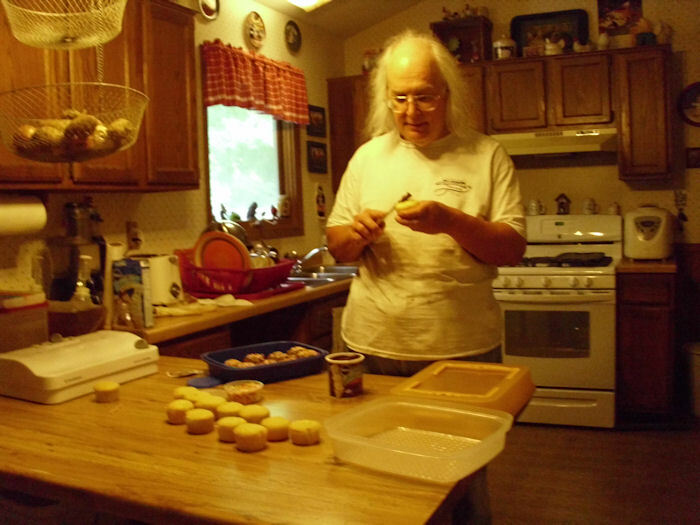 Making cupcakes will allow us to freeze what we can’t eat immediately and take them out a little at a time for deserts. The directions on the back of the package are easy to understand. The batter turned out nice and smooth. Spooning it into the individual cupcake cups took a bit of practice, but I got the job done. I used a toothpick to check whether the cupcakes were done. When the toothpick is clean, the cupcakes are ready to go. Here’s a picture of me putting the frosting on. 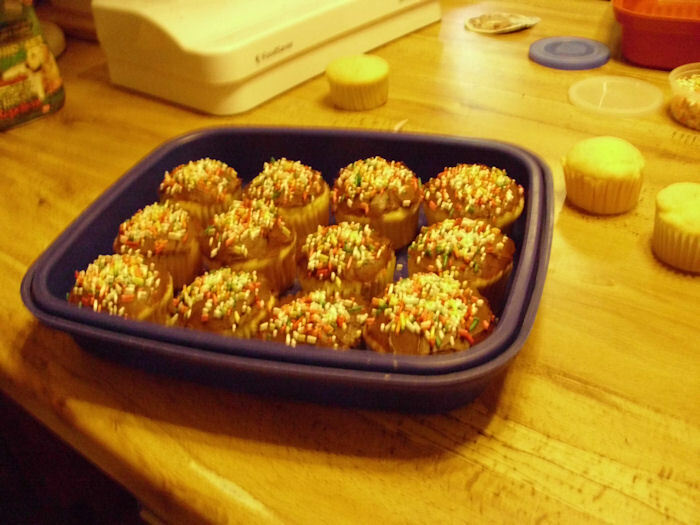 As you can see, I had a little trouble keeping the cupcakes an even size. I’m sure that I’ll get better with practice. We ended up with 21 cupcakes instead of the 24 that the package said we were supposed to get. Even so, some of the cupcakes were a bit on the small side. Rebecca says she usually gets 18 cupcakes out of a package and I must admit that if mine had been more evenly sized, I probably would have gotten 18 too. Unless you want truly pathetic looking cupcakes, you won’t get 24 out of the package. So, what did they taste like? The cupcakes turned out moist and I didn’t notice any difference from any other packaged cupcake I’ve eaten (I tried one without frosting so I could check the cupcake, rather than the cupcake with frosting). There wasn’t any difference in consistency either. Overall, I think someone would be hard pressed to tell the difference between these cupcakes and any other mix. 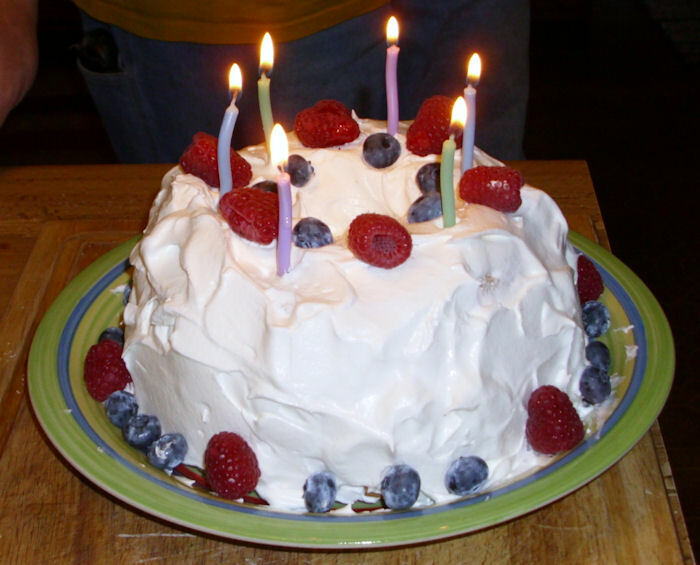 The frosting is a little smother than canned frosting with sugar in it and a bit less sweet. The frosting lacked any sort of aftertaste though, so you couldn’t really taste the artificial sweeteners. Even so, if someone thought it might be a sugar free product, they’d probably be able to tell the difference in the frosting. It doesn’t taste bad (quite the contrary), it’s just a little different. My first experiment with sugar free baking has been a success, so I’ll try it again in the future. The next time I’ll try baking a cake. If you’re on a diet or diabetic, I can recommend this combination though as a sweet alternative to losing control over sugar.